Well, it just did not work for me to make it up to the little fiber event in Tennessee over the weekend. It was a two-steps forward, three-steps back situation, and while I was a bit disappointed, not going was the right choice. Besides, I might have wanted to pick up a little bit more fiber, and I already have quite a bit here. Just thinking of what awaits me in the stash is more than enough to keep me happy at the wheel. 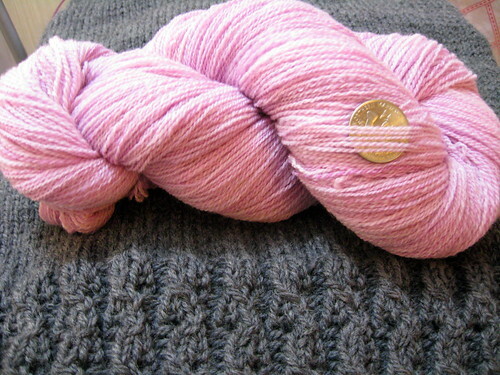 I finally finished spinning the pink singles I began during the Tour de Fleece. I tried something a little bit different with these. I did not completely spin one bobbin of singles and then the second. Instead, I alternated between the two. This was a tip from the dvd, The Gentle Art of Plying. We will see whether I notice a difference. I think this is going to become a lace scarf, but I will wait to decide until after I see what kind of yarn I have when it is finished. So far, I am really pleased with the results, as it seems softer, squishier, and sproingier than anything I have ever spun before. It is still in the process of drying, and I only gave a half-hearted attempt at guessing yardage. I think I might have somewhere between 750-850 yards, but I will definitely do a re-check before picking a pattern. Next up on the wheel was a fail. Everything about that wool was a battle, so I stopped and looked for something else. There was a small adventure with silk, but the skin on my hands was not right for it. Time spent in the wash water for the pink yarn saw to that. 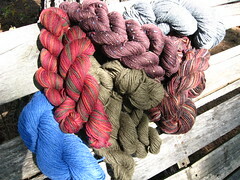 Then I grabbed some lovely alpaca, and then I divided the fiber for a three-ply yarn. Kiwi is loving the different oil I used when I changed the bobbin and pulley, and I think I am liking the yarn I am creating. I would get back to the wheel now, but my Salt Peanuts cardigan is in need of attention. I noticed something was not right, and had to frog a bit. I have checked the errata, and am back on track. I would be more irritated that there were mistakes in the pattern, but I am just enjoying the knitting of this sweater too much. As you already know, I have been knitting some shawls. You have seen parts of them, but pictures of the finished pieces had to wait until after I had gotten them to where they were meant to be. 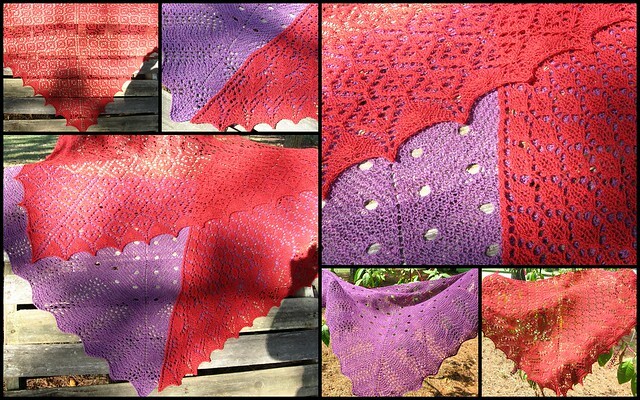 To me, when I make a shawl for someone, I think of it as a knitted hug. And hugs were exactly what I wanted to send to three friends from long ago. When the Time is Right, Right? It seems that I think about it at all the wrong times. When the heat of the summer seems like it will never end and I am longing for Fall, it creeps into my mind, but the idea of that growing fabric of stranded wool covering me pushes it away almost as quickly as it entered, and it stays away for a while. When I think about it in the middle of winter, it feels ridiculous to knit it, as the next occasion to wear it is so far away. Then there are times like now, when it would be quite natural to be knitting it, if it were not so close to the big day and finishing it in time is more pressure than I want, and even if that were not the case, it is an unrealistic timetable for completion. However, what might be more ridiculous than any of these, is having the yarn and pattern and just letting it sit. That makes me want to form a plan. I considered just casting on now, but I worry that pressure to finish before the end of the month might take away some of the enjoyment, and it might mess up my tension, and that is even more trouble on a stranded project. The next logical time (in my mind, at least) to cast on would be Groundhog Day. That idea really appeals to me. You know how I like to celebrate Groundhog Day in the biggest way I can, although my options are usually quite limited. Still, that is months away, life is short, and I forget things. Then, I began to think about other events coming soon, and whether I would participate. NaBloPoMo will be here before we know it, and along with it is NaKniSweMo. While I do not really feel like the former, this could be excellent for the latter. While not a complete sweater, I think all that is involved qualifies it. Besides, I really do not think the innerwebs knitting police are interested in what I am doing. Well, I hope it does. I was desperate, and despite hitting more record highs, (though the rumors are for cooler temperatures soon) I have started swatching for Salt Peanuts. I needed to find something new to knit, and I was in a hurry. I had made the mistake of knitting a couple of rounds on a long-hibernating sock, and it nearly stole my will to live. Anyway, although the cardi from Verena is prettier, I feel more like knitting something a bit plainer and looser fitting. As for the sock, I will return to it soon, and it knows the score--grow or go. Last week was Fall Break and we were looking for something different to do. None of us was really up for much of a road trip, so we went to Unclaimed Baggage. If I had been there on my own, I would have spent my time there differently, but instead, it was a bit disjointed and random. Actually, that describes me a bit, but that is neither here nor there. Anyway, I finally made my way out to the annex building and found a little bit of yarn. 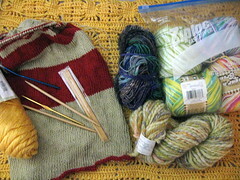 The first find was a bag with a partial blanket on the hook, a partial top on the needles (might be a cotton/linen yarn), a skein of handspun, a partial skein of either Noro or Boku, some kitchen cotton, as well as a few extra dpns. Next up was a full bag of some Knit Picks seconds yarn. As the paper states, it is a little overspun, but I can think of several ways to make it work for me. I had better, as I now have ten skeins of this sportweight yarn. Besides, I knit with my handspun often enough, and it is often overspun, too, so I should be good. Anyway, the last bundle I found was very interesting . 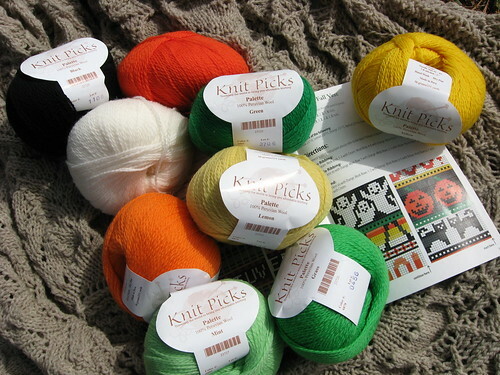 I was hopeful as I looked through a sealed plastic bag containing Knit Picks Essential in Multi and Tweed, Wool-Ease, and Cascade Pastaza (some of which was in the form of several knit mitered squares). I was a bit concerned upon opening the bag, as the yarn inside had a heavy, perfumed scent that was not my favorite. However, after a dunk in some hot water and wool wash, a rinse in the morning, an afternoon on the clothes rack, and I have some fabulous new yarn. I love the weather we have been having lately. Cooking and baking are much more pleasant now that they do not make it so hot in the house. I have a few loaves of bread in either the oven or cooling. I am also getting ready to bake a coconut cake for a party this weekend. The cooler temperatures also make me want to knit sweaters. It is good that I am not fast at knitting a sweater, as I do not really need too many, but I have quite enjoyed looking at patterns lately. I think I might knit Salt Peanuts in grey. I think I have enough of a yarn that will work in the stash, so that makes it something of a front-runner. Then again, Helen gave me this lovely magazine, and among the many lovely patterns inside, the cardigan on the cover really calls to me. Of course, I am smitten by the Exclusive Orenburg Shawl, but for some reason could not convince any of my friends that it should be the next knitalong. 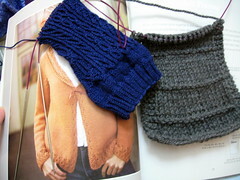 Then again, I might need a moment before tackling that 50"x98" triangular shawl, but back to the cover cardi. I actually think I might have a good yarn in the stash for it, too, so we shall see what I do. By the way, do you see the bit of red laceweight yarn lying on the magazine? That is what was left after binding-off the Medallion Lace Shawl. Someday, I will perhaps have more stories of the red, lace yarn of abundance, but for now, I have blocking, photos, and mailing to do. Yes, we all know how spectacular I am at that last one. 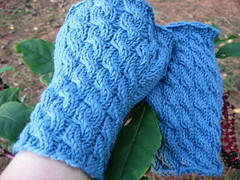 I brought these Serpentine Mitts out of hibernation for travel knitting. It worked out well, and steered my mind toward portable knitting. They have been nice to keep with me to work on while we have been out-and-about on errands and in waiting rooms. Their small size and ease of working on while on the go almost makes me want to knit socks again--almost. I have been able to work on these mitts a bit more, and I only have one more thumb to knit before I have a finished pair. However, before finishing those, I decided to begin some others. I used Fetching as a starting point, and ended up with these. 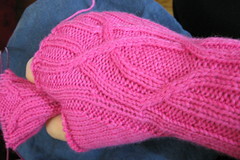 If I knit them again, I will make 2-4 fewer increases on the thumb gusset. Still, I like the pair, and they stretch and snuggle most any size hands. We have been doing some home maintenance and improvement. Last night was painting, and it required having the door open for a bit. This let a few mosquitoes in for us to swat and squish. More got in than I had figured, as I discovered over two dozen bites on my feet when I was getting ready this morning. That was a bit of a puzzler, but I spent more time thinking about the odd dream I had just had. It was a bizarre one that had many celebrities. I cannot remember most of them, but eventually I ended up in a yarn store where the yarn was 50% off, but the prices were already too high, so the discount only brought things down to a few cents below what most stores charge. Anyway, Bill Murray was working there, by the Cascade 220 if I recall correctly. I sat down on one of those stability balls across the display from him, and he is going on with some anecdote. I could not tell whether he was eventually going to try to talk me into or out of buying yarn when the alarm clock sounded, and I was awake and the dream was over. After reading about my dream, you would probably feel cheated if I did not share my Unconscious Mutterings for the week, so here they are.